The BikeIT Membership Club is a comprehensive program addressed to our members who often rent bikes. We provide the ability to have access to unique services and exclusive benefits. 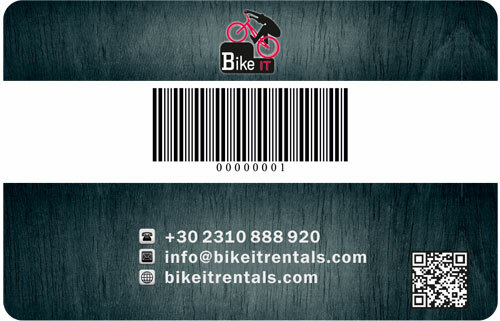 Completing 10 rentals within a period of one month, we offer you a gift, an hourly rental with a bicycle of your choice. From your 12th rental and then, within the month, 10% discount is added for your next rentals. Namely, you earn a total of 30% discount on any bike you choose. The membership card is personal and issued to individuals who are over 18 years old. There is a possibility of a family membership card, in which the member gives his/her consent to the use of the card from the rest of the family without his/her presence to the store. In this case, rental is allowed to minors by showing the membership card, the holder of which is taking the responsibility. There is systematic information to the members from our company for any new benefits and privileges. For more information, please address to our store. IMPORTANT:If the card is lost, inform immediately the store.